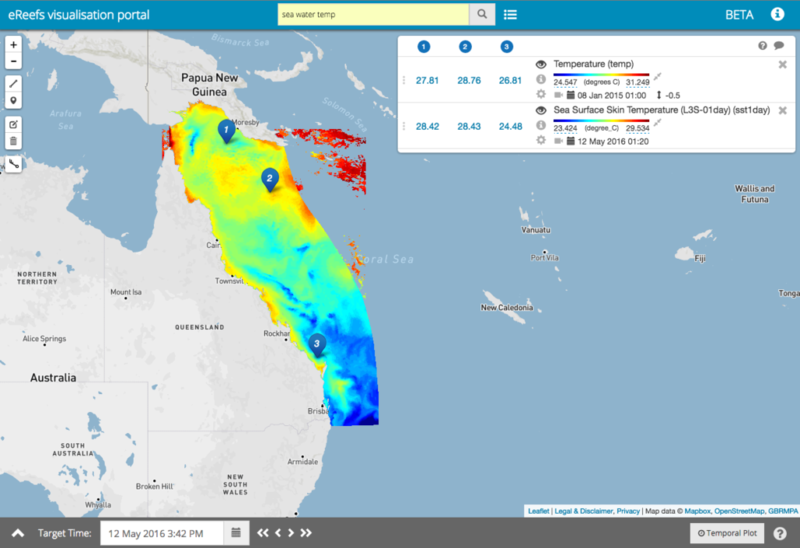 An eReefs data visualisation portal has been built to provide access to eReefs data products. The portal is currently in Beta release, please contact us to let us know if you find any issues or have any suggestions. Users can search for available data, load it to the map and find detailed information about the various data services associated with data products. 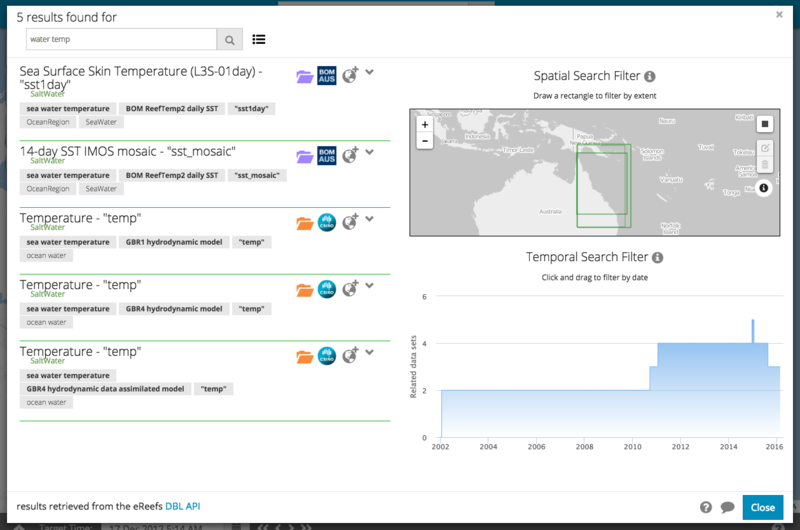 The data visualisation portal feeds off the eReefs Data Brokering Layer, which includes many additional “semantic web” elements which improve the discovery of connected systems. 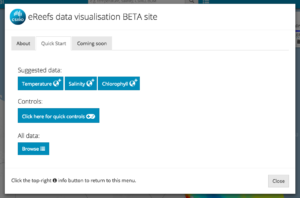 To start using the data visualisation portal, click the ‘Quick Start’ button or tab on the landing page to quickly load some commonly used data. 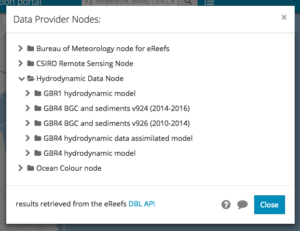 You can also use the Node Explorer to browse the available data. Alternatively, search for data using the search box. 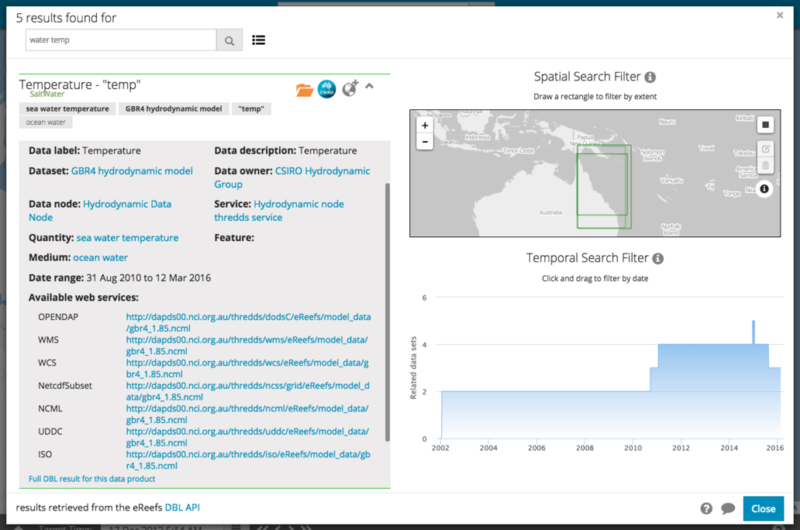 You can search for parameters such as ‘temperature’ or ‘salinity’ or you can search of data custodians such as ‘CSIRO’ or ‘BOM’. The search box will provide suggestions based on data that is actually available within the Data Brokering Layer. Start typing to search for available data. Once you have reached the search results screen, you can browse through the data results. The map and temporal chart show the geographic and temporal extents of the data. These can also be used to filter your search. To limit to a particular geographic area, draw a box using the ‘Draw a rectangle’ tool at the top right of the map. To limit by date, click and drag the area of interest – or pinch and zoom on touch devices. The icons and tools provide you with more information about the data product such as where the data has come from (Data Provider Node) and who owns it (Data Owner). 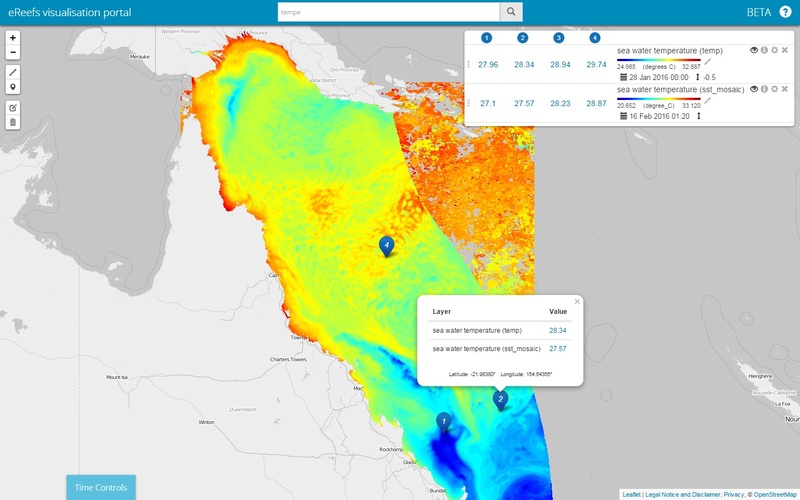 You can also add the data to the map and access more details about the data. The icons and tools available in the search results. 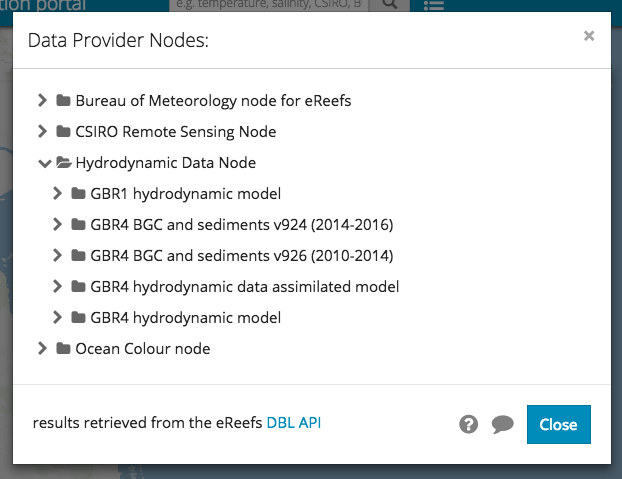 To get more detail on any dataset, click to expand the details section. As shown below, this section provides you with more detailed information about where the data has come from, any additional descriptions about the data, the date range and the available web services. You can click each of these links to access the web service directly. Once you have loaded data to the map, the legend will be updated and the layer should load on the map. Some large datasets may take some time to load. The Layer Manager in the top right contains a lot of information and tools to help you interact with the data. See below for help understanding the legend. You can adjust each layer’s opacity, elevation (if available) and line colour for graphing by clicking the ‘Layer settings’ tool. 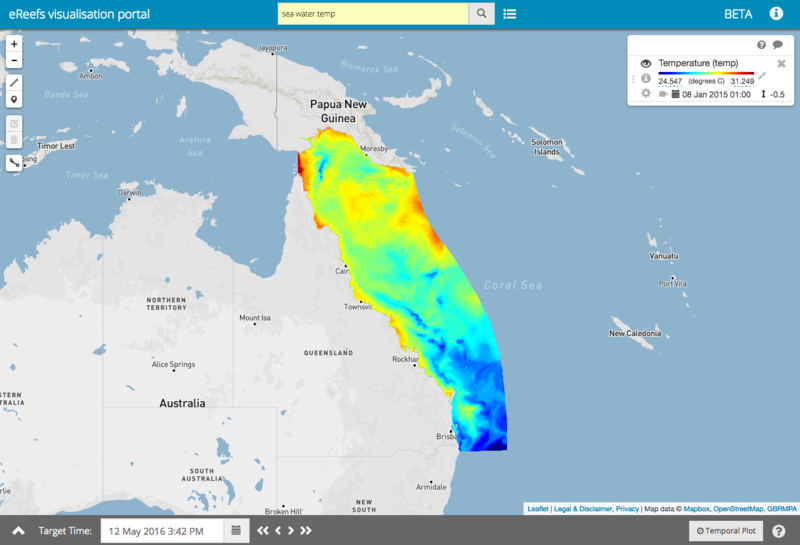 It is important to note that at the moment, the date, elevation and colour scale are unique to each dataset. Tools are being developed to help synchronise these. When you change the Target Time, each layer will show data for the nearest available date. The components of the eReefs visualisation portal legend. For data with a temporal dimension, we are able to combine time slices to create an animation for a given time period. Press the video icon to open the Animation Configuration for a layer with temporal data. Select the time period to ‘step’ between time slices. Press play – note it may take a little time for the server to build the animation. Note that the animation takes a maximum of 24 time slices. At the top left of the map, there are a series of ‘drawing tools’. See below for information on using these tools. Draw a transect Draw a line on the map with graph of visible data along the line. Draw a marker Add marker to the map with data for each visible layer. Edit layers Edit existing transects and markers. Delete layers Delete existing transects and markers. Toggle wind Show experimental wind visualisation (6 hourly 1° data from NOAA). Once you have added markers to the map, the values for each marker will be added beside each layer in the legend. This allows you to compare data at points through multiple layers. You can also get the values at each point by clicking on the marker on the map. The eReefs Visualisation Portal has a “master” time used by all visual components – called Target Time. Map layers, marker values, charts etc. all automatically use data closest to the current Target Time (actual time slice being used is shown in the Layer Manager). To view data for a particular point in time, simply use the date/time picker or forward/back controls to update the Target Time in the footer. Additionally, all layers added to the map are visualised on a Temporal Plot. 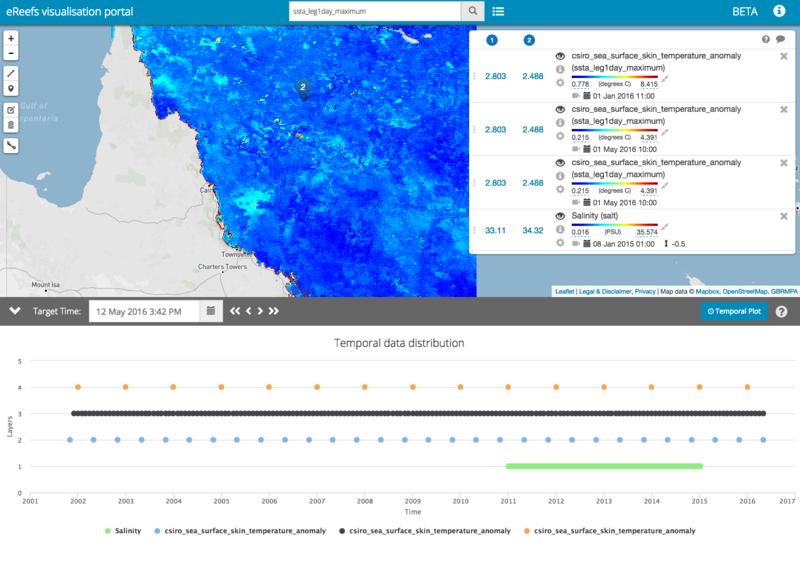 The Temporal Plot provides a simple way to understand the temporal distribution of data, and makes it easy to quickly find a temporal intersects between datasets of interest (click point on chart to set Target Time). We are continuing to work on additional functionality including advanced charting, data downloads and improved controls for dates, elevation and colour ramps. Check back shortly for more information or contact us to provide feedback.